Lynn Petr received a call one evening from farrier, Ed Meador. After much hesitation, he prefaced his request with, "Now I don't recommend horses to anyone and Lord knows I don't recommend ponies, but a client has one that's just too good to kill". With further explanation it seemed a lady was selling all her horses and had one pony left. He was turned out on 80 acres of grass by himself, so of course he foundered. Instead of taking the time necessary for his recovery, this lady was sending the pony to the killers. Ed had known the pony for a few years and realized he had special qualities not always found in ponies - manners and no vices. He was hoping STAR would save him. You have to realize in this business, Lynn receives calls all the time from people trying to give us horses. Many of these give-a-way horses are old, lame or full of vices, so she has to be very critical and emotionally detached. Her normal procedure is to screen the animals in person before bringing them to the farm for more in-depth testing. We didn't have this kind of time. There wouldn't be a place to send him if he failed our screening and Ed couldn't even remember how big this pony was (or he conveniently forgot!) But, against all her normal policies, for some reason she agreed to take the pony if Ed would care for his feet. Bucky arrived a few days later. Out of the trailer hobbled a shaggy, TINY pony. Lynn's first thought was, "Oh geez, here's a useless with a capital "U"! How are we ever going to use this guy? Her second thought was, "Isn't he just darling?! He was so...so huggable. As the owner was preparing to leave, she walked over to Bucky, put her hands on either side of his halter to pull his velvet muzzle up to her face. Lynn thought it a sweet goodby gesture until she heard the words she spoke, "You better be on your best behavior here or you'll go off to the meater". Lynn was shocked! After all, it was her fault he foundered in the first place. As she drove away Lynn stood holding the lead on her new fuzzy friend, and promised him he would have a home either at STAR or with her. Bucky's life at STAR began. The first few weeks of stall confinement to battle the laminitis were stressful for the little guy...but only because he couldn't see over the half door! He rubbed all the hide off his chin by following people with his nose as they passed by. We replaced the door with a stall guard which made Bucky so happy. If ever we were missing a volunteer we knew where to find them - down at Bucky's stall. He was like a magnet - a healing fluffy bundle of positive energy. Bucky spent many years as the "wonderpony" of STAR enticing first words from many children on the Autism Spectrum. He was known for bringing his head around upon dismount to gently hug his rider. His accomplishments were recognized by being the first equine to be inducted into the Tennessee Animal Hall of Fame. He was also given the JC Penny Golden Rule Award which had never been presented to an animal. Bucky was also the NARHA (PATH Intl.) 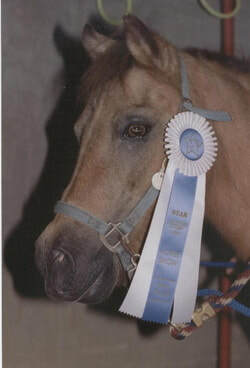 horse of the year for Region 5 in 1991. He stayed at STAR through retirement and lived to the ripe old age of 44. He is buried on the hill overlooking the facility where his memory lives on. We were blessed to have known such a wonderful soul.